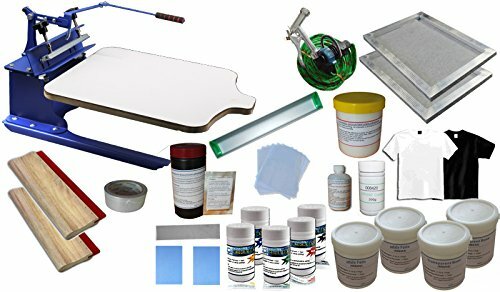 This kit is especially designed for new hand to learn and apply 1 color T-shirt printing. We provide this 1 color manual screen press package with high quality at a reasonable price, designed to easily set-up and print. As to single item' detailed description, video, clients can find them in our store. It's very suitable for doing your DIY printing business. Applications It can be applied to costume, woven fabric, metal, paper, copybook, plastic, wood, glass, ceramic, leather and other products which need flat printing. They are especially suitable for small enterprise and individual use. Max thickness of screen frame clamp is 0.78 " (2cm) , it could be adjusted according to the thickness of the substrates. Adjusting the adapting piece to lift up the screen frame at a angle of 30-45 degree. Put up the handgrip will lay down the screen frame. The handgrip could be moved with 5.5" (14cm) in the horizontal direction, suitable for the screen frames which size is less than 23.6" (60cm).